The Marshalla Oral Sensorimotor Test (MOST) is a comprehensive and quick assessment designed to put a numerical value on oral movement, oral-tactile sensitivity, facial and oral tone, as well as basic respiration, phonation, and resonation skills. The MOST is the first exam to allow speech-language pathologists an opportunity to place a numerical value on the oral exam. It identifies jaw, lip, and tongue movement problems. It is optimal for children with concomitant feeding difficulties, neurological deficits, developmental disorders, and sensory processing disorders. The MOST normative sample is made up of 160 children from across the U.S. The Motor Function subtests of the MOST are designed to identify a client's control of jaw, lip, and tongue movements and praxis through 21 simple probes. Speech-language pathologists often write general observations about respiration, phonation, resonation, and oral movement. 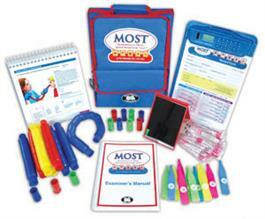 The MOST allows speech-language pathologists to provide scores to back up their claims. Click here for a comparison of typical report statements with examples of report statements provided by the MOST. The MOST Qualitative Response Analyzer lets you enter data from a childâ€™s record form(s) and will automatically generate the percentage of correct responses and the qualitative descriptions of the childâ€™s incorrect responses. Click here to go to the MOST Response Analyzer. Large illustrations on the test easel are a beautiful guide provided for the therapist to use as a model for each test item. COMPLETE MOST KIT INCLUDES: Examiner's manual, test easel, 30 Record Forms, 30 Case History Forms, all the oral-motor supplies to give the test, and a sturdy tote bag (2007).